The diagrams below indicates heat loss from uninsulated pipes with bare surfaces at still-air conditions and air temperature 70 oF (21 oC). The emissivity coefficient of the surface is 0.95. Engineering ToolBox, (2008). 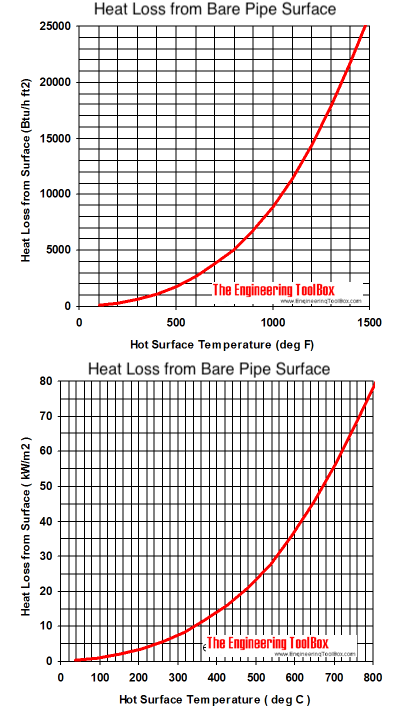 Heat Loss from Bare Pipe Surface. [online] Available at: https://www.engineeringtoolbox.com/heat-loss-bare-surface-d_1153.html [Accessed Day Mo. Year].